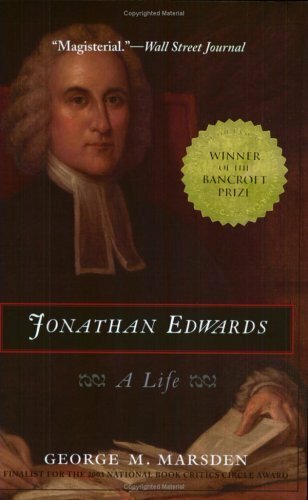 "Jonathan Edwards (1703-1758) is a towering figure in American history. A controversial theologian and the author of the famous sermon Sinners in the Hands of an Angry God, he ignited the momentous Great Awakening of the eighteenth century." "In this biography, Jonathan Edwards emerges as both a great American and a brilliant Christian. George M. Marsden evokes the world of colonial New England in which Edwards was reared - a frontier civilization at the center of a conflict between Native Americans, French Catholics, and English Protestants. Drawing on newly available sources, Marsden demonstrates how these cultural and religious battles shaped Edwards' life and thought. Marsden reveals Edwards as a complex thinker and human being who struggled to reconcile his Puritan heritage with the secular, modern world emerging out of the Enlightenment. In this, Edwards' life anticipated the deep contradictions of our American culture." --BOOK JACKET.